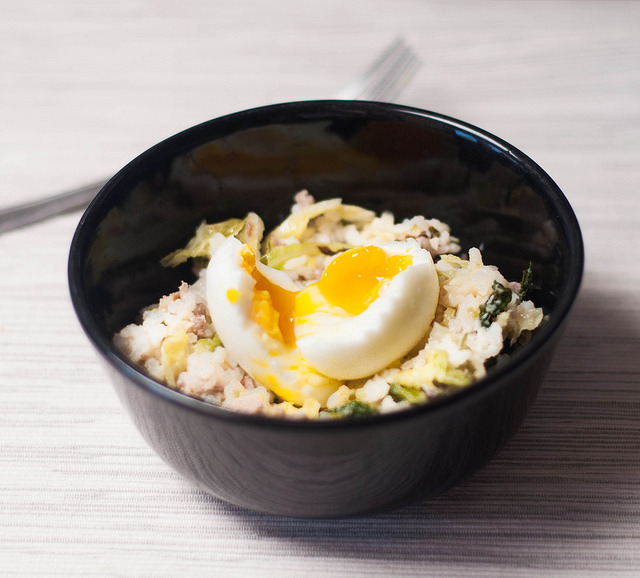 Chefs say that cooking eggs is a good judge of technical skill in the kitchen. Have you noticed this? In every chef interview that I read (which is a lot of them) if the subject turns to judging cooking skills, the benchmark is almost always eggs. And while I wonder sometimes whether in practice eggs cookery is used to judge new chefs, there’s no doubt that the idea makes sense. Eggs are surprisingly difficult to cook well and there are hundreds of ways to do it – and as a result hundreds of ways to do it wrong. 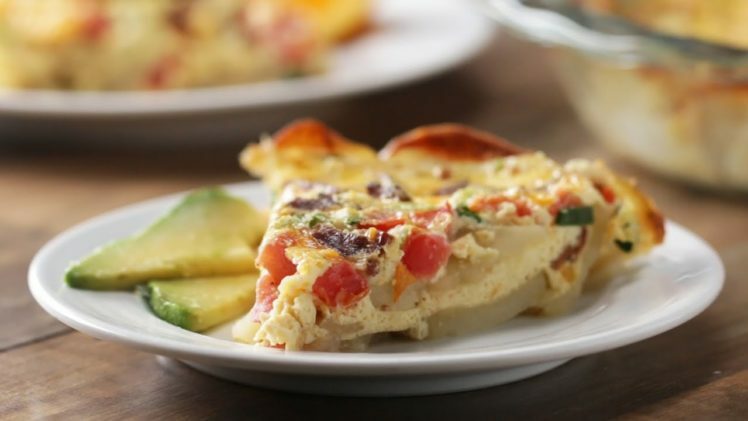 Plus everyone has their preference for how any given egg dish should taste; runny yolks or firm, large or small curds in a scramble, French- or American-style omelettes, and those are just the basics. Over the years I’ve slowly learned how to make eggs well. It started with omelettes (French style please), which admittedly Jeff is much more accomplished at making than I am. Years of flipping, dropping eggs on the floor, trying again. Then I moved on to scrambled eggs, trying different methods and styles until I settled on a favorite (medium curds while Jeff prefers smaller curds). 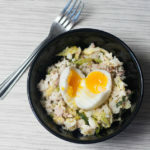 And there are always over-easy fried eggs, added to leftovers or morning oatmeal. They were our staple for years, along with the greasy pan that came along with them. But more recently I’ve moved from the fry pan, conquering the perfect soft-boiled egg with the help of the Ivan Ramen cookbook. Ramen is the most common place to find a soft-boiled egg and it was in a bowl that I first had one, with the soft yolk melting into the hot soup. The first time we tried to make them at home we ended up with half-cooked whites that wouldn’t peel. They were inedible. But the second time, and every time after that, it’s been perfect. 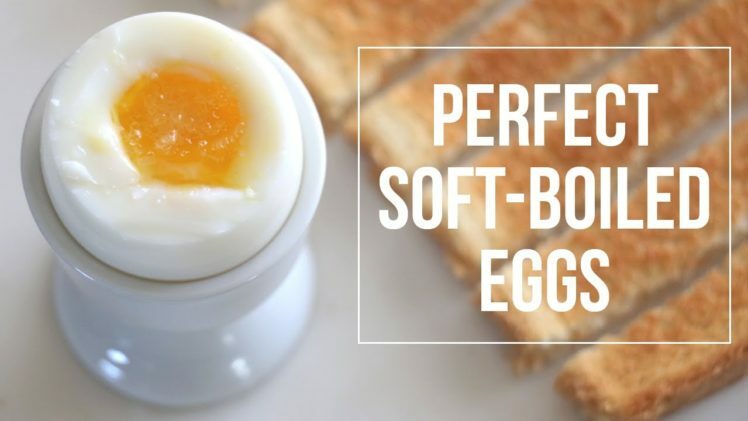 Soft-boiled eggs are an easier version of poached eggs – runny yolk, just barely cooked white, and none of the odd shapes I inevitably end up with when trying to poach an egg. Now if only I could master the hard-boiled egg. BOIL a pot of water on medium-high heat, big enough so that when the eggs are placed in it they will be completely covered and water temperature won’t drop below a boil for more than 30 seconds. I use a small pot/two cups of water for 1-2 eggs, a medium pot/one quart of water for 3-4 eggs, and a large pot/half gallon of water or more for 5+ eggs. ADD eggs gently to the already boiling water. Keep the heat on medium-high so the water continues to boil and set a timer for 6 minutes. SET UP an ice bath with a bowl of water and a few ice cubes to place the eggs in when they’re done and set it aside. REMOVE the eggs from the boiling water when the timer goes off and immediately put them in the ice bath for at least a minute. 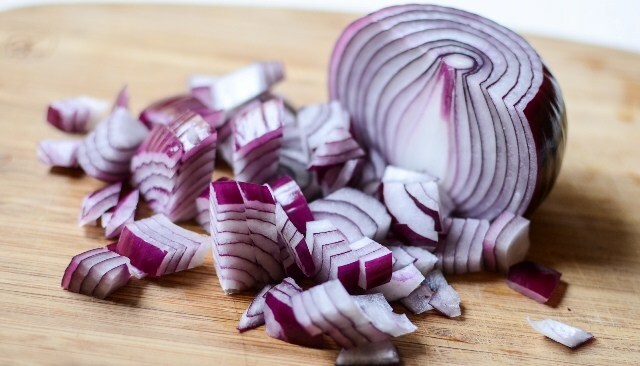 Then peel and eat immediately or you can refrigerate them for a week and reheat them in a bowl of hot (but not boiling) water for a few minutes before eating. 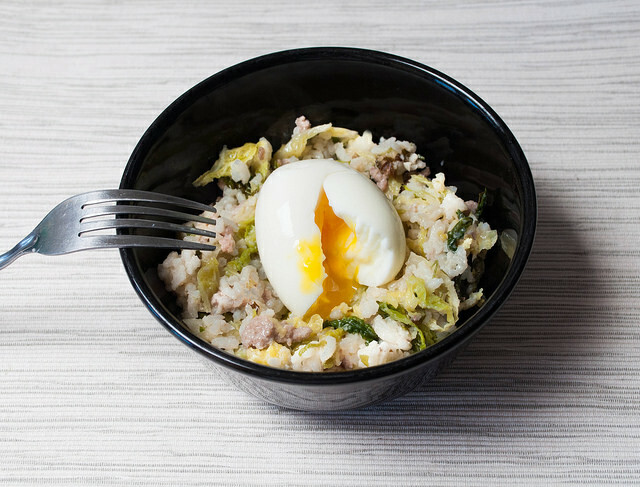 For those who are curious, the delicious bowl of food under that lovely egg is a riff on this recipe substituting cabbage for bok choy. The calendar may say March but the weather here is not really cooperating. It’s been rainy and windy and cold the past week for which the only cure is hot and comforting food. There are lots of options with this “theme” but there’s one in particular that I’ve been craving. 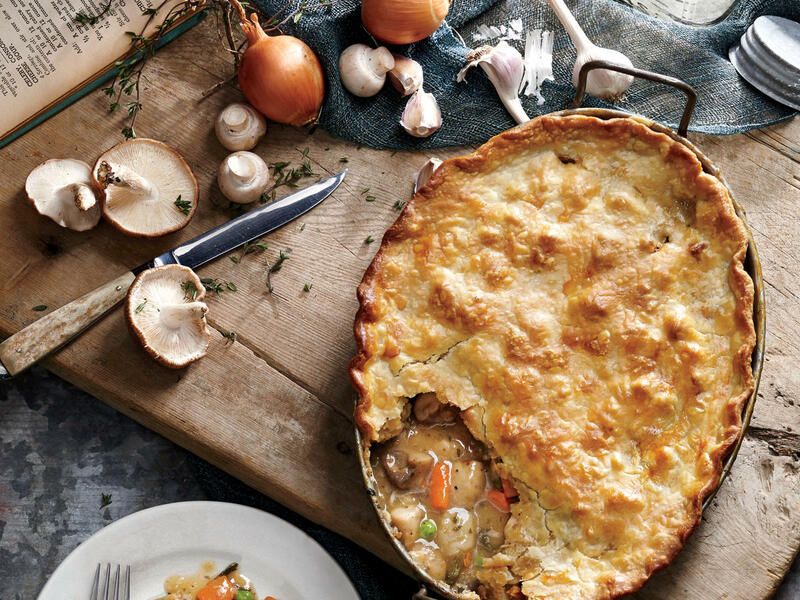 Since we drove past a sign for the Marie Callendar’s outlet after a weekend in Santa Barbara, all I can really think about it chicken pot pie. But chicken pot pie has been done. I mean, I have a great recipe for it and I’m sure you do too. 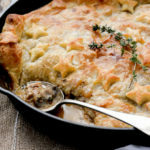 So instead, I started thinking about how to shake up the recipe without losing the basic elements – a good crust and a creamy gravy to hold it together. 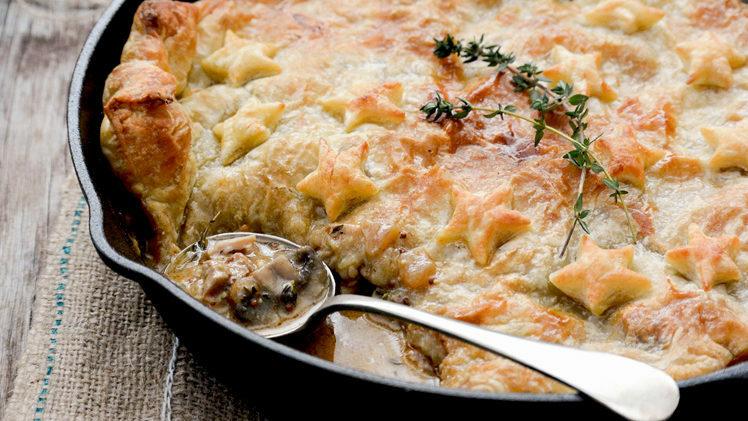 I also love the flavors of chicken marsala, so I let that influence how this pie came together. Oh man! We only just finished eating this pie and I already kind of want more. It’s creamy and peppery and a little sweet from a hit of sherry to the filling. Jeff requested a biscuit crust, about which I was openly skeptical, but the end result was pretty perfect. It’s not a flaky crust but it is tender and crumbly and adds a good dimension to the rest of the pie. Even better, since the crust doesn’t really need to set and you don’t have to worry about using cold butter to create flaky layers, this pie doesn’t take very long to throw together if you have leftover chicken or have picked up a rotisserie for this purpose. Looking through the ingredients list, there isn’t anything particularly fancy or complicated about this dish. And that’s kind of the point of comfort food – it tastes familiar. In this case, the finished product is not traditional chicken pot pie, which means I won’t spend the whole meal berating myself that it doesn’t taste like so-and-so’s. Instead, the taste is comfortable but interesting and it doesn’t bring up any comparisons to perhaps better incarnations of this dish, which means more credit for the cook. So if you’re in for a dreary and cold weekend, well, you have your work cut out for you. White whole wheat is different from regular whole wheat flour and is also called whole wheat pastry flour. It is softer than traditional whole wheat but is ground with the bran so it still has the nutty flavor of whole wheat flour without creating brick-like baked goods. Put a large sauté pan over medium-high heat and add 1 tbs butter. Once the butter starts to bubble, add the mushrooms and ½ tsp salt and let cook for about 5-10 minutes, until the mushrooms release their liquid and it evaporates from the pan. Continue to cook the mushrooms until golden brown on at least one side. Remove them from the pan into a large mixing bowl. Add the onions to the pan with 1 tsp salt and cook for a few minutes over medium-high heat until they start to brown around the edges. The pan should also still have some brown bits from cooking the mushrooms. Add ¼ cup of water to the pan and scrape the pan to release any browning that is stuck. When the onions are lightly golden and most of the brown has been scraped up, scoop out the onions and put them in the bowl with the mushrooms. Add the cooked chicken to the bowl. Return the pan to medium heat and add 3 tbs of butter to the pan. Once the butter is melted, add 2 tbs of flour and whisk them together to create a roux. Cook the roux for a few minutes to get rid of any floury taste and then slowly add the milk, a few tablespoons at a time. Add a small amount of milk and whisk it into the roux before adding more. Once you’ve added about ½ cup of milk, stop and cook the mixture for a few minutes to thicken it. If you want more sauce or the sauce is too thick, add up to another ¼ cup of milk, again adding and whisking a few tablespoons at a time. Once the sauce has thickened slightly, turn the heat down to low and add 1 ½ tsp of freshly ground black pepper. Taste for salt and add up to 1 tsp kosher salt if needed. Remove the pan from the heat and let it cool. You can at this point refrigerate the filling for a few days. To make the crust, combine the flour, baking powder, and salt in a large bowl. Cut the butter into cubes and incorporate it into the dough using your fingers so that it ends up evenly distributed into the flour but remains in pea-size or larger pieces. Add the milk and stir to combine but do no overstir. Once the mixture forms a dough with all the flour. Divide it into two pieces and refrigerate for about 15 minutes – this is a very sticky dough so refrigeration makes it easier to work with later. While the dough is cooling, grease a pie pan. Once you are ready to roll out the dough, preheat your oven to 400F. Flour your counter or cutting board and roll out one half of the dough until it is large enough to fit into your pie pan; it will end up about a 1/8 inch thick. Arrange the crust in the pie pan and spoon the filling on top** Roll out the second half of the dough until it is about 1/8 inch thick and lay it gently on top of the filling. It’s a somewhat delicate crust so it will likely crack while you are trying to move it – don’t worry about that. Just press the cracks back together on the bottom crust and leave them on the top as air vents. Press the edges of the dough together to seal the pie and cut off any remaining edges. Bake for 30 minutes or until golden brown spots appear on top and around the edges. Let the pie cool for at least 10 minutes before serving. You can also make it ahead and reheat it at 350F for 15-20 minutes when you are ready to eat. Since the alcohol is added after the heat is off, it will not cook off as effectively in the oven as it would on the stove top. If this worries you, you can add it to the sauce with the heat on, before you add the chicken/mushroom/onions, but if you don’t the final product will not be or taste alcoholic. The longer the filling cools, the better the final pie and the easier it will be to work with when putting it in the crust. I don’t go in for concrete, goal-oriented, measurable New Year’s resolutions. Each January I designed a new theme for the year – there was the year of getting into better shape, the year of exploring more about Northern California, the year of being better about finances. It spreads the pressure over 12 months instead of concentrating it all in in just one. The results have been good, or at least good enough to keep up the tradition. This year is the year of decluttering – exciting I know. And this yearly theme idea, it works just as well for a blog as it does for the rest of my life. Not the decluttering bit, although I might get around to that, but having a year-long focus, something to recommit to every month. Ok, pie is not exactly a new thing to commit to on this blog. There are a fair number of recipes already that profess my love of pie. There are some sweet, and some savory; there’s even a wedding pie in the archives. But it’s not like most New Year’s resolutions are creative or unique. And once I came up with the idea, I couldn’t say no to a year of pie. But then, well, January is sort of an awkward time to talk about pie. It’s not exactly an indulgent time of year what with the perennial “lose weight”, “get in shape” resolution machine (see above about uncreative resolutions). I’m going to start this off slowly, with a savory pie. Quiche, to be exact. Quiche is something I’ve talked about here before, almost exactly a year ago. But this one, the first in the Year of Pie, is different. It’s not the filling – although I did take out the cream in favor of yogurt, mostly because I usually have yogurt and rarely have cream. It’s the crust – I swapped the traditional crust for a potato crust; a layer of grated potato, squeezed dry, and mixed with some flour, egg, and salt. 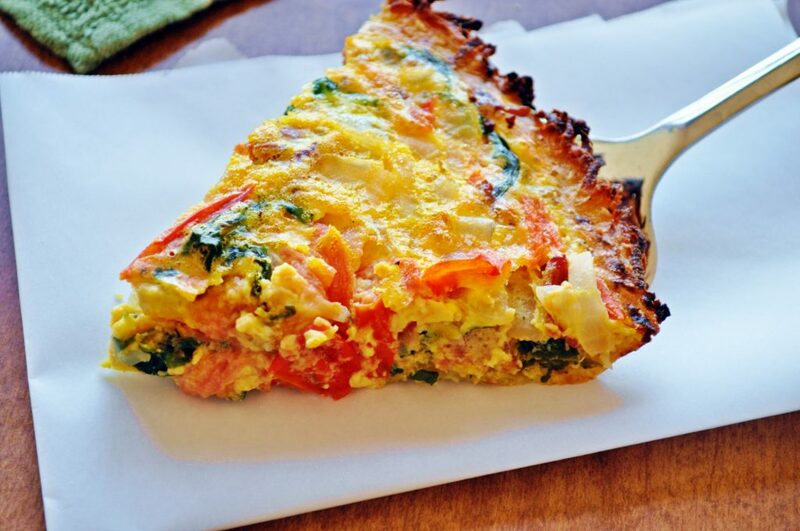 It’s part quiche, part potato latke. 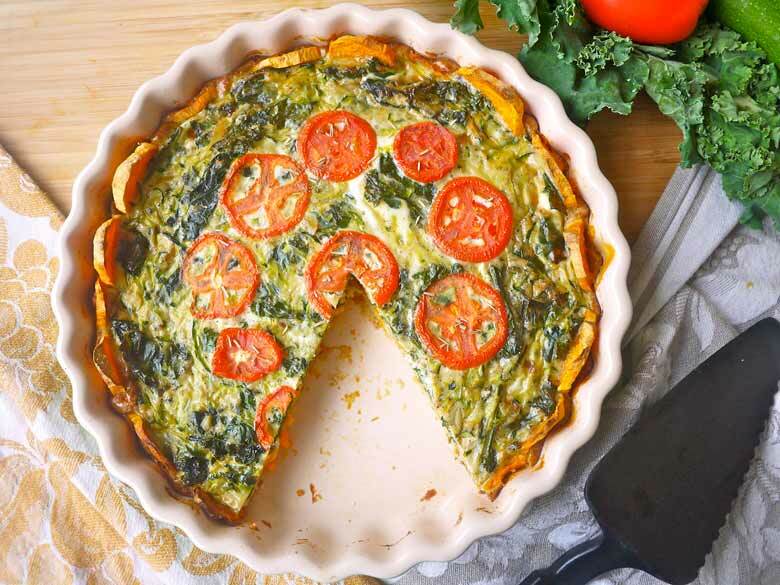 I might even like it better than a regular quiche, and it comes together way faster since there’s no need to have a pre-made dough in the fridge, chilled and waiting for you. Because as much as I’d love to be the person who always has a spare pie crust in the freezer, I’m just not. I am however, the person who probably has a few spare potatoes rolling around in a drawer. This year is off to a good start. 1-2 cups of filling – chopped vegetables meat, cheese, etc. – I used sautéed shallots, roasted peppers, and feta; ham and cheddar is a good combination too, or tomatoes and pesto. GRATE the potato into a dish cloth and squeeze out as much liquid as possible. MIX the dried potato, egg, flour, salt, and pepper in a medium bowl until well combined. PAT the mixture into a pie pan in an even layer – it helps to use a cup or a glass to pack it in evenly on the bottom and sides. BAKE the crust for 20 minutes, until the edges are lightly browned. BEAT the eggs with your filling and season it with salt – use more if the fillings aren’t salted. Add the yogurt too, for a creamier filling, or leave it out if you don’t have any around. POUR the filling into the prebaked pie shell and return it to the oven for another 10-15 minutes. Start checking it after the 10 minute mark and bake it until the filling is set all the way to the middle. You may need to poke the center to make sure it’s not uncooked. 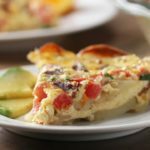 Like any quiche or frittata, this version keeps well for up to a week and it’s good warm, cold, or room temperature. I like to experiment with the fillings, and by experiment I mean use up whatever is left in the fridge. A few months ago my brother-in-law visited and I made dinner for him. I don’t remember exactly what I made, but I do remember he was impressed that I’d made a meal with multiple parts on a weeknight. The meals he makes at home for his family, he noted, are generally one-pan affairs. I kind of shrugged it off as a nice compliment. It’s not every day that your brother-in-law visits from the other side of the country and my brother-in-law has a toddler, so presumably I have more time to make dinner than he does. I didn’t really think much more about it, until a few weeks ago. I make dinner most nights of the week and usually it’s not a big deal. Early on in my home cooking adventures I fell pretty hard for the standard ideal that dinner requires a main and two sides. That’s how my mom cooked, even when she didn’t really have enough time to do it and the process was a burden. That’s how dinner looks at a restaurant, or on a sitcom, or in a magazine. But a few weeks ago I was stressed about having enough time and energy to make dinner on top of work, running, and just having time to myself. Standing in the kitchen, thinking about my brother-in-law’s offhand comment, it seemed completely ridiculous to hold myself to a picture perfect standard. I generally like making dinner, and I want to keep liking it. Making myself crazy with self-imposed dinner requirements is not going to help. In the last few weeks I’ve tried to give myself permission to make more one dish dinners, or at least more things that only require one cooked component and minimal prepping to bring together the rest of the meal. This cabbage recipe meets that goal. I discovered this way of making cabbage a few years ago and while I loved it, I usually loved it as a side dish. Stir fried cabbage could certainly be a part of dinner, but I wasn’t ready to commit to it as the main component. I aspire to be the kind of person that can happily serve a roasted vegetable with a fried egg or some cheese and call it dinner. But I’m not there yet. There’s also the fact that if I were to plunk stir fried cabbage on the table as dinner, no matter how delicious the cabbage, I would have a lot of push-back. And I don’t think I’m alone in that – it’s a hard sell. Sandwiches though, are an easy sell. I stuffed mine with cucumber, tomato, and hummus before piling in the spicy cabbage. You could add pickles or some shredded rotisserie chicken, substitute some other spread for the hummus, or add some shredded carrots to the cabbage while it cooks. The bottom line is the same: one pan. Ten minutes of cooking. Dinner for two plus leftovers. I could get used to that. HEAT the oil in a large pan over medium heat. Add the cabbage and 1 tsp of salt and cover the pan for a few minutes until the cabbage has wilted down a bit. Remove the lid and stir. ADD the hot sauce and garlic to the cabbage and cook for another 5-8 minutes, until the cabbage is cooked through and may be browned in some spots. Taste and add any additional salt needed to season the cabbage. ASSEMBLE pitas by spreading some hummus inside the pocket, loading it up with cabbage, and then adding cucumber and tomato slices (if using) and drizzling with hot sauce. 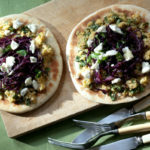 Or put all the components on the table and let people assemble their own pitas.The panfried cabbage will keep for about 10 days in the fridge and is good just on its own, cold, hot, or served at room temperature. 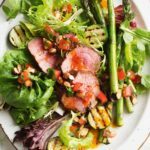 This makes a great light dinner as is, or you could add some pre-made falafel or rotisserie chicken to make it more hearty. I’m not a huge fan of the word ‘casserole.’ It always brings to my mind something a little gloopy that’s made mostly with boxes and cans and almost no fresh ingredients. Those things can be surprisingly delicious (a friend brought an excellent green bean casserole to Thanksgiving last year) but I’m often a little skeeved out by what’s on the label. Yes, I’m a bit of a snob when it comes to foods that come in a package and shouldn’t have as long a shelf life as they do. It’s not that I’ll never eat them but I would be lying if I said that I make them in my kitchen. Which is why I struggled about calling this a Mushroom Onion casserole. I was worried that you, like me, might be a bit of a snob when it comes to food and see the word ‘casserole’ and think it’s probably not something you’d want to make. Because you want to make this. It’s creamy and rich and kind of amazing considering how few ingredients are in it. I thought about dressing up the title, adding ‘caramelized’ to describe the onions and mushrooms and talking up the ‘walnut crumble’ on top. But it felt kind of weird. This isn’t a fancy cooking dish. It has no delicate crust and it doesn’t make clean slices. It’s warm and comforting and it makes me want to curl up in a thick sweater and slippers and eat a big bowlful. It is truly a casserole – baked in a casserole dish creamy ingredients that bind it together, without a crust to make it a pie. I’m ok with that if you are. With three kinds of cheese to its name, this isn’t winning any awards for being low-fat. 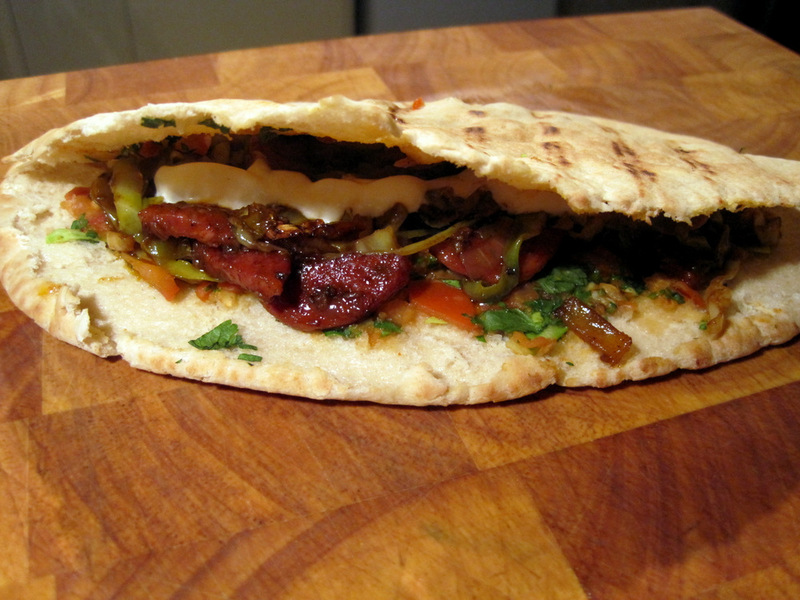 But its richness also comes from the deeply caramelized vegetables that make up the bulk of the dish. 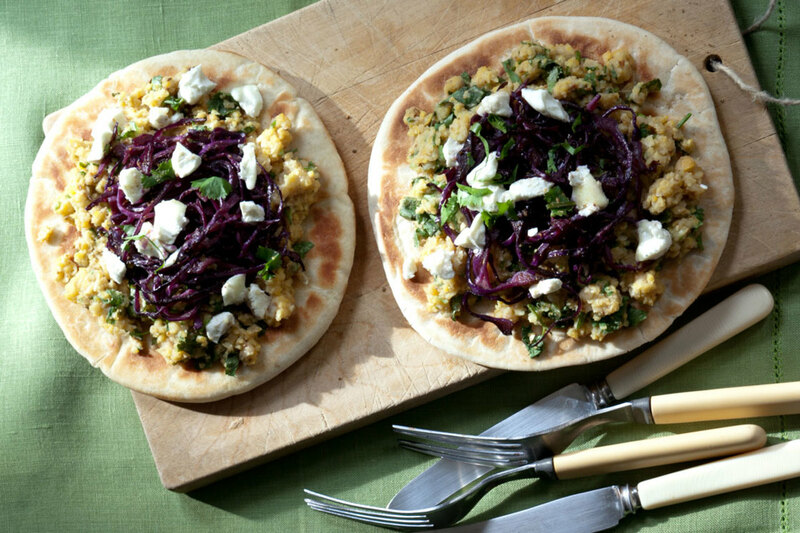 The sharpness of the feta is a welcome contrast to all that creamy softness. I could imagine all sorts of ways to dress this up – use fancier mushrooms, add some additional herbs (like thyme and oregano or add a kick with some chile flakes), caramelize the onions slowly, or add a more luxurious cheese to make this a dish that is all about richness. But I also love that it comes together with just the things you find in the grocery store. Not the fancy gourmet grocery store. The regular one. Where you can buy the things for those other casseroles. You know what I mean. In case you haven’t checked the calendar, it’s November which means it’s NaBloPoMo. This month I’ll be trying to post a new tidbit every day. Let’s spend it together, shall we? In the meantime, if you have things you’d like to see, we have plenty of time so leave a comment below and I’ll try to get to it. Heat a large skillet over medium heat and add a tablespoon of fat. 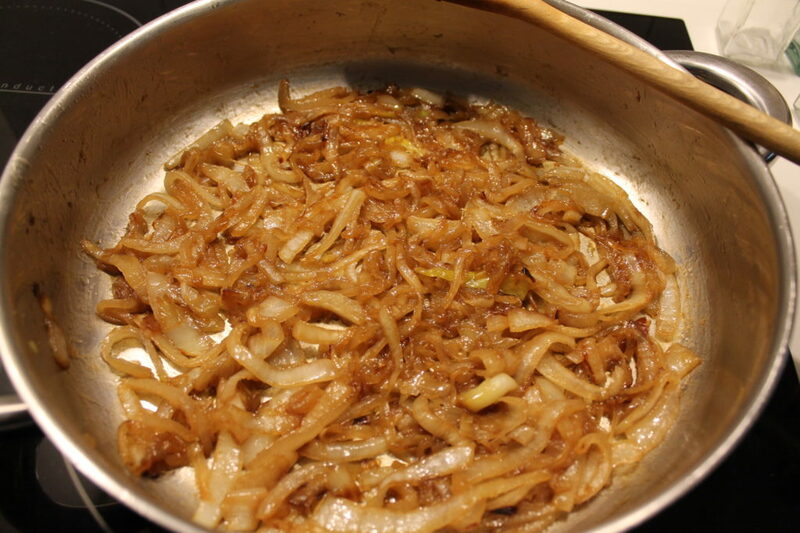 When it’s warmed add the onions and about a teaspoon of kosher salt and cook the onions until they caramelize. If you’re using the method discussed by me few days back for quicker caramelization, use the scraping method twice and add 1 tbs of Worcestershire sauce for flavor. Traditional caramelization could take an hour or two and it’s not really necessary since onions are just part of this dish. When the onions are done remove them to a bowl, wipe out the skillet, return it to medium heat, and add another tablespoon of fat. Add the mushrooms in relatively small batches to avoid crowding the pan – mine made about 6 batches total. Cook the first batch until the mushrooms have lost some water and have started to brown on at least one side, about five minutes. Then push that batch to the outside edges of the pan and add a new batch to the middle. 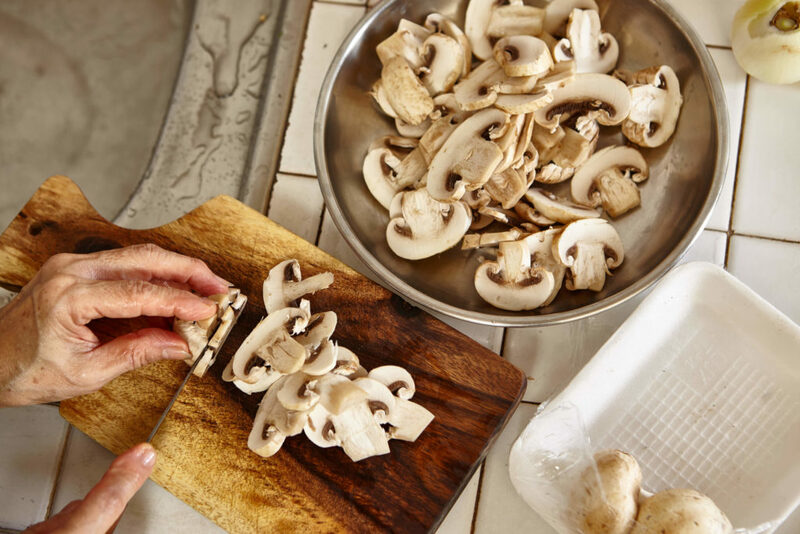 For each batch after the first take a minute to stir the older and newer mushrooms together when the middle newer mushrooms are partly cooked enough to push them out to the edges. Add the remaining fat, one tablespoon at a time when the pan looks too dry and the mushrooms on the edges start to stick. 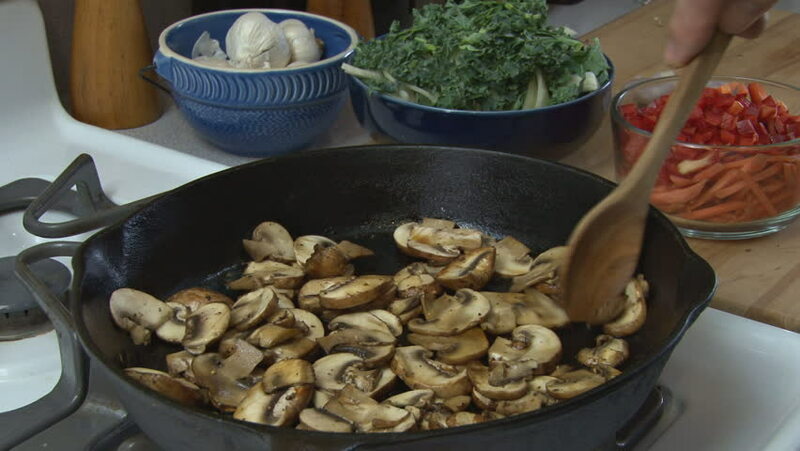 When you do, make sure to swirl it around the pan so that it goes all the way out to those edge mushrooms. When the mushrooms are done, turn the oven to 350F. Grease an 8 by 11 casserole dish (a typical 9 by 13 pan will be too big) and set it aside. In a large mixing bowl combine the onions and mushrooms and set them aside for 20 minutes to cool. When it’s cooled add the egg, ricotta, feta, 2 teaspoons of salt, and as much pepper as you like. Spread the mixture into the greased casserole dish and flatten the top using a spatula. Combine the chopped walnuts with the parmesan and sprinkle that over the top. Bake the casserole at 350 for 30 minutes, then turn on the broiler and broil it for 2-3 minutes just to toast the top. Keep an eye on it so the walnuts don’t burn. Sprinkle the finished dish with parsley right before you serve it. 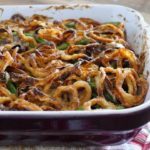 In casserole dishes like this, use whatever kind of fat you like. Butter will add some extra richness. Olive oil will add a pleasant bitterness. We have a fairly constant stock of rendered animal fat so I use that. 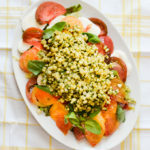 Yes, the parsley adds a much-appreciated bit of color (we do eat with our eyes too after all) but don’t think that it doesn’t also serve a flavor function. 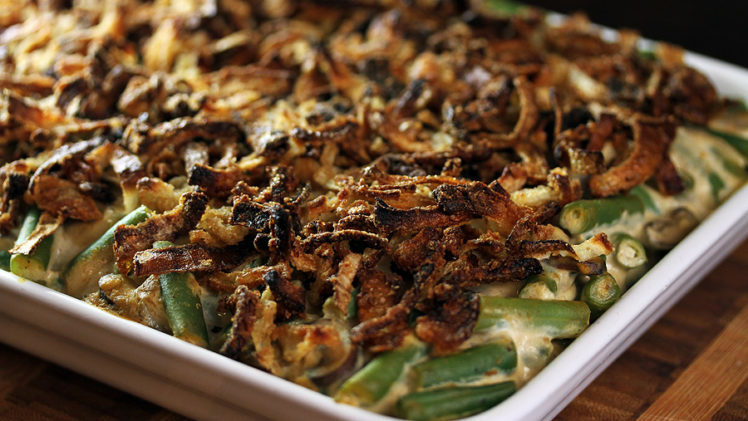 The fresh greenness of it goes well with the creamy richness of the casserole. You’ll notice if it’s not there. Typically when I cook things I season everything while I cook it. But mushrooms have a lot of water and salt draws it out. Adding it at the end means those leftover juices can be mixed into the filling rather than being evaporated in the pan. I don’t go in much for adventure cooking. The dishes with too many steps or too many fancy ingredients rarely happen here. My mom had a rule when it came to cooking – if the recipe went onto the second page, she wasn’t going to make it. It’s a rule I’ve mostly adopted in my own cooking. But I also love to challenge myself when it comes to cooking. I just don’t think “challenge” means buying expensive ingredients or using all the pots and pans I have to make a sauce. My own personal challenge these past few years has been learning how to cook pork. It may seem mundane to some, but it’s been good to spend time thinking about how to use different cuts, what flavors go well with pork, and what temperatures to cook the meat to. 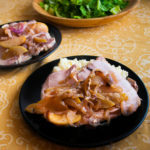 Failing to produce a good pork chop, coming to the realization that pork and applesauce is very good while pork and apple cider vinegar is not quite as nice. You see, we didn’t eat much pork in my house growing up. We didn’t go so far as to keep kosher but my parents had when they were growing up and so pork never really entered either of their repertoires, with the exception of bacon which admittedly only started after my brother insisted. My first pork chop was at a friend’s house. I’d called my mom and outright lied about dinner (“Um, we’re having pizza, bye”) not out of fear of her response, but of some divine retribution. I fully expected a thunderbolt to strike me down with my first bite. It didn’t, and the pork was dry anyway. 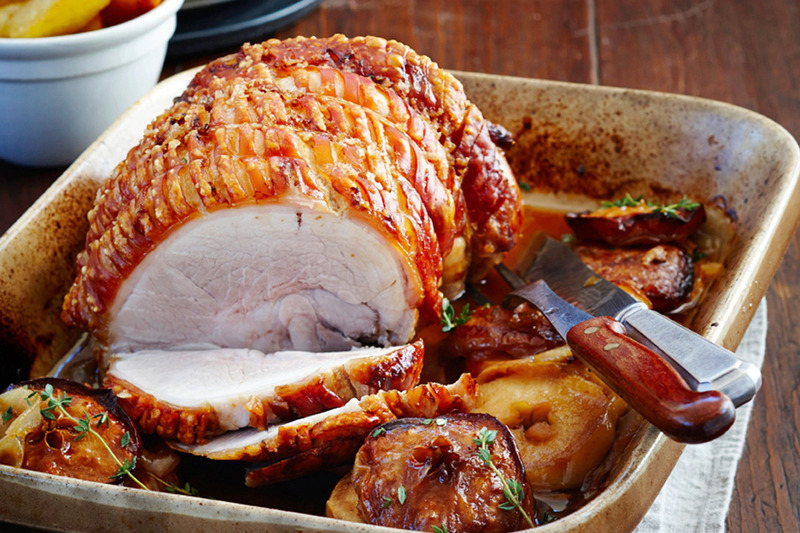 Perhaps you’ve already unlocked the secrets of roasting pork, but I’ve only just gotten there. It’s my kind of kitchen challenge. And damn, it tastes good. So, about those secrets I learned? Here they are, in no particular order: Pork is good with apples but not so great with acid. Use any vinegar or lemon sparingly. Pork also isn’t as fatty as some of us grew up thinking and many of the cuts are pretty lean. If it doesn’t have intramuscular fat (like loin and chops) then cook it hot and fast so the meat doesn’t dry out. If it does have a lot of fat mixed in with muscle, cook it low and slow to really break everything down. If you do that in a slow cooker, let the cooked dish sit overnight in the fridge so it’s easy to get rid of some of the fat – there will be a lot melted off; more than you want to eat. Preheat the oven to 425F and get out a glass baking dish. 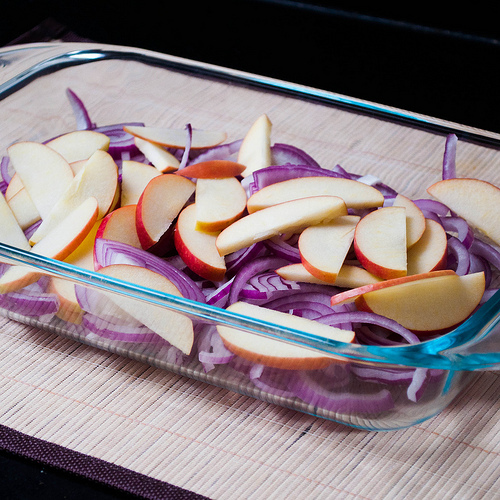 Line the bottom with the apple and onion slices, add 1 teaspoon salt, and toss it together. 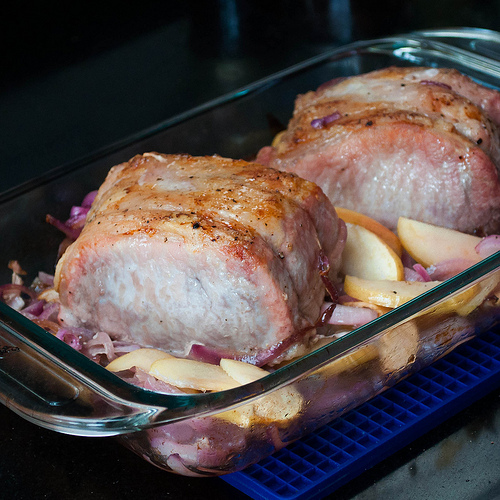 Use the remaining 1 tablespoon salt and the pepper to season the pork, then place it on top of the onions/apples. Oil the top of the pork and roast it for 15 minutes at 425F. Then drop the heat to 350F and cook for another 30-45 minutes, until the pork is 145-150 in the center – that will give you a juicy and very slightly pink in the center piece of pork. Yes, the USDA says 145 is a good temperature for pork. Slice it up and serve with the apples and onions and some additional applesauce on top. It also keeps well for up to a week in the fridge. To reheat it, put a pan over medium heat and add the apples/onions to the bottom. 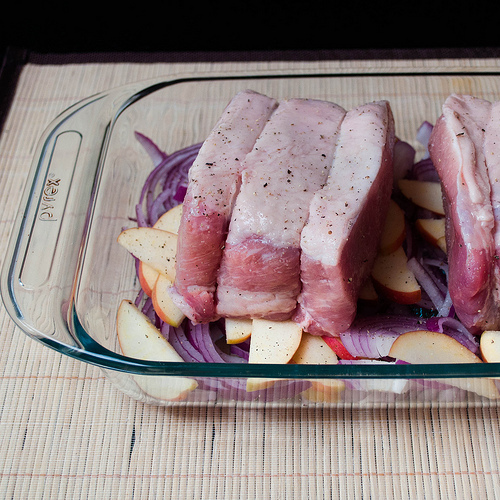 Place the pork slices on top and cover the pan. Let it warm for about 10-15 minutes at which point the pork should be hot but not overcooked since it was over the vegetables. Sometimes you just need a hug. Last week was pretty much like that except that people I needed to hug all live on the East Coast, near or in the city of Boston. There’s a lot to love about living in San Francisco but when tragic things happen, the distance between the coasts feel even bigger. It’s made me homesick for New England and wishing I could find a better way to show people out there how much I love them. So this chocolate sorbet will have to do. After all, food is an expression of love. This is my love letter to Boston. This sorbet is for you. But before I raise your expectations: this is not chocolate ice cream. I’m not actually a big fan of that, mostly because I don’t think chocolate ice cream really tastes like chocolate. All the dairy gets in the way and what you end up with is this muddled milky chocolatey flavor which is just not as good as the real stuff. If I’m eating chocolate I want it to be dark and rich; I want to good stuff. You probably do too, right? This is the good stuff. It’s essentially a mix of hot chocolate and actual chocolate, melted together and frozen into someone scoopable. It’s for people who wish chocolate ice cream tasted more like chocolate. 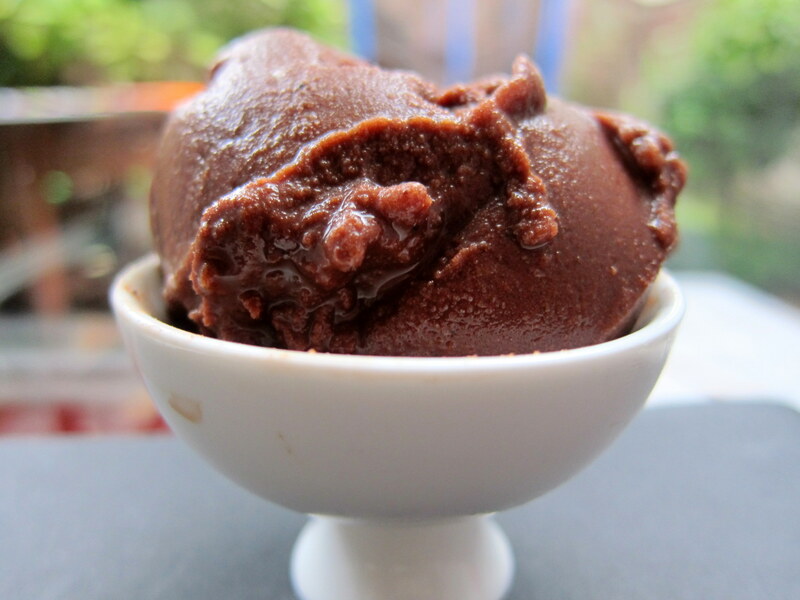 There’s an amazing local chocolate maker in San Francisco called Tcho and when I made this sorbet this time around, I was inspired by my favorite of their chocolates. It’s a “citrus” flavored one but without lemon. Their chocolate is pure cacao and sugar with the flavor coming from the beans themselves. I used actual lemon but the point is the same: chocolate and lemon make a wonderful pairing. I’m sure you know about chocolate and coffee, chocolate and nuts, chocolate and berries, even chocolate and orange. The lemon is just as good albeit less well known when used sparingly. The citrusy tang with the fruitiness of good chocolate – it’s a whole new thing and a delicious one at that. 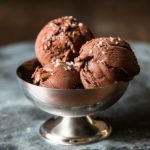 Chocolate is a good thing and this sorbet is certainly a good way to say “I love you” – although the words themselves are just as good. It’s not a cure-all but it’s still a little salve for what ails you. A sweet pick me up after a hard week. As much as I’d like to, I can’t reach through the screen and share this with you. But if I could I’d be at the front door, with open arms. And a pint full of ice cream. 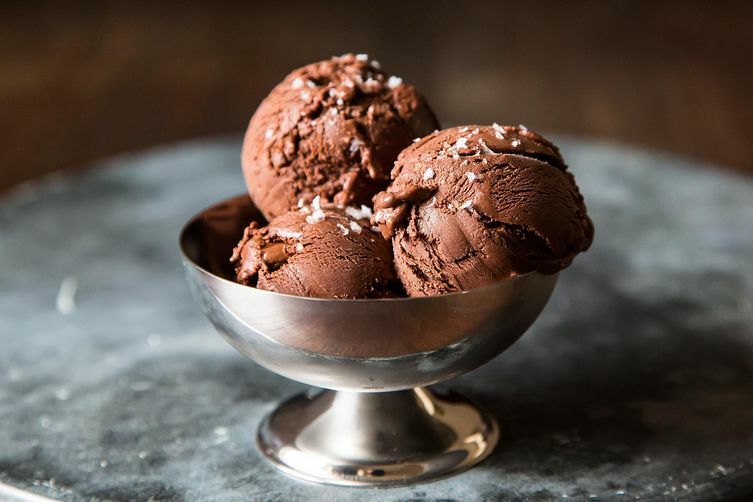 Adapted from The Perfect Scoop, by David Leibovitz Makes about a quart of sorbet Lemon and chocolate is my thing but maybe yours is nuts and chocolate, in which case substitute almond extract for the lemon. Or maybe you like berries so use a spoonful of jam. What about coffee? Add a teaspoon of espresso powder to the second batch of water. 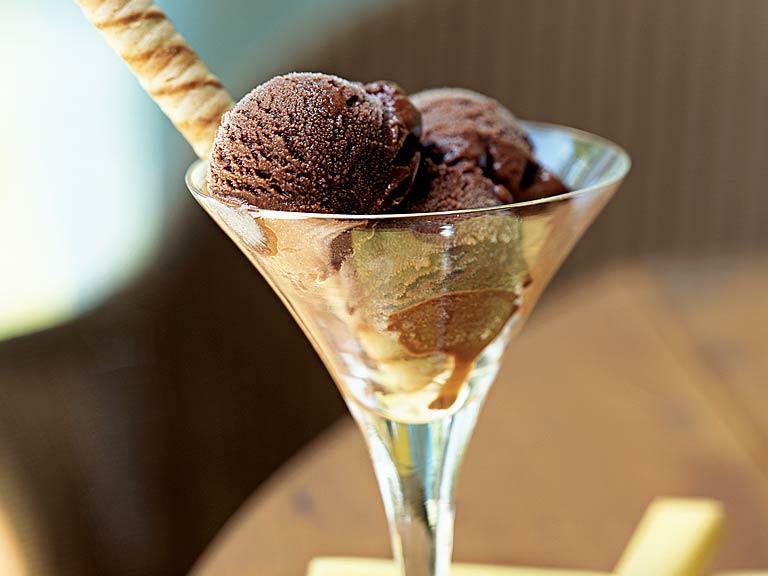 Sorbet doesn’t have as much fat as ice cream and it has more water which means it freezes harder than ice cream will. You might want to let it sit out for a few minutes before scooping it. In a medium saucepan, combine 1 1/2 cups water, white sugar, brown sugar, cocoa powder, and salt. Put the pan over medium-high heat and bring the ingredients to a boil. Let it boil for about a minute, whisking continuously, until everything is melted. Then remove the pan from the heat and add the chopped chocolate. Continue to whisk until the chocolate is melted. Add the remaining 1/2 cup water, the lemon juice, zest, and lemon flavor to the chocolate and stir to combine. Then chill the mixture thoroughly before freezing it in your ice cream maker. 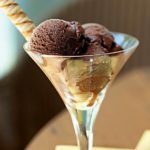 Alternatively you could pour the chocolate sorbet base into ice cube molds or other small containers and freeze it, then put the small amount of frozen sorbet into a food processor and process until smooth. It won’t get rid of all the ice crystals but it isn’t a bad way to make sorbet or ice cream without an ice cream maker. To prevent the finished sorbet from getting freezer burned, put a piece of parchment over the sorbet in the container so that it isn’t exposed to air. It should keep in the freezer for at least a month, if it lasts that long. Chocolate chips often have stabilizers in them to help them hold their shape after baking so I wouldn’t recommend using them here. Get a good bar of chocolate and chop it up. There’s this awkward time between 5:30 and 6 pm when I sometimes find myself wanting a snack. It happens a few hours after my usual afternoon snack, and uncomfortably close to dinner time. It’s too late to eat much without ruining your appetite, but still too far away from meal time to ignore completely. That’s the time when I usually make this strawberry milk. At some point while searching for a not-quite-snack, probably after a run, I thought of chocolate milk. It’s ubiquitous at running events, as a good way to recover after finishing a race and before going out to eat. But I don’t much like chocolate milk. Strawberry was always my milk flavor of choice. You know, from back in elementary school, when things like your choice of flavored milk were still relevant. 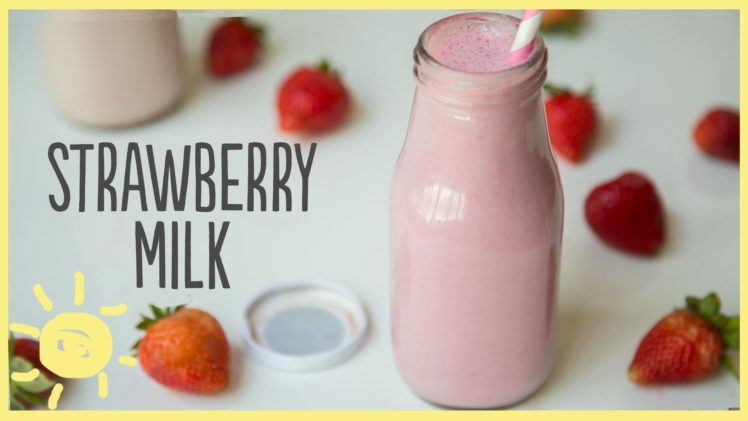 When strawberries are in season I just throw some a half cup of fresh strawberries in the blender with two cups of milk (I use almond milk because it lasts longer in the fridge), and a few cubes of ice. 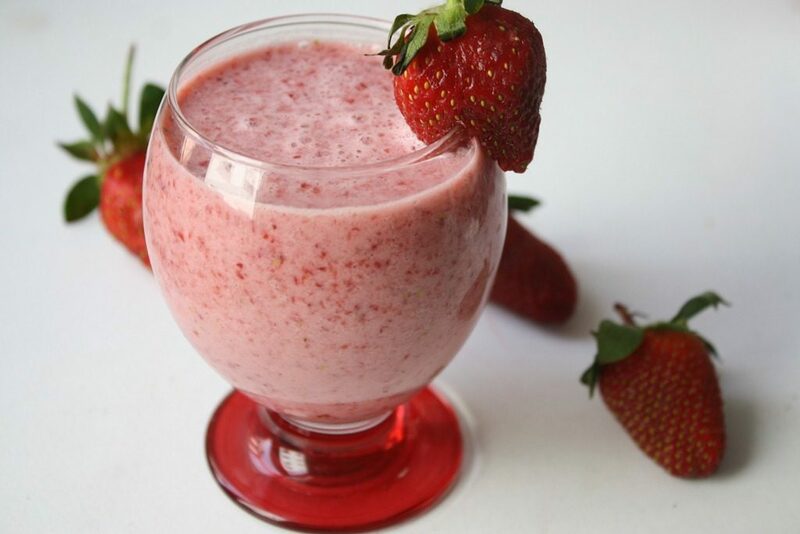 Or you can use a cup of frozen strawberries and a dried pitted date (or other sweetener of choice) blended with the milk. Drink it immediately, slurping up every last drop. I will eat pretty much anything pickled. Sure I love the typical things like cucumbers, green tomatoes, and green beans but it goes much further than that. I’ve been known to snack on pickled cocktail onions with cheese. A few weeks ago I got super excited about a pickled egg appetizer at a bar around the corner (delicious, by the way). When we go out to eat, Jeff will often pass me any mediocre pickles that accompany his dish, which I will almost always eat. There is no fruit or vegetable that I can think of that I would not happily enjoy once it’s been steeped in vinegar and salt. And if you’ve been following this blog since the beginning, you know that this is not the first time I’m sharing a pickle recipe. 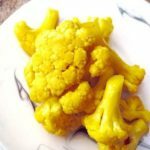 The idea for cauliflower pickles came from something I saw at the store. San Francisco is home to more interesting food treats that I can hope to ever buy so I often try to recreate the things I see on a more reasonable budget. 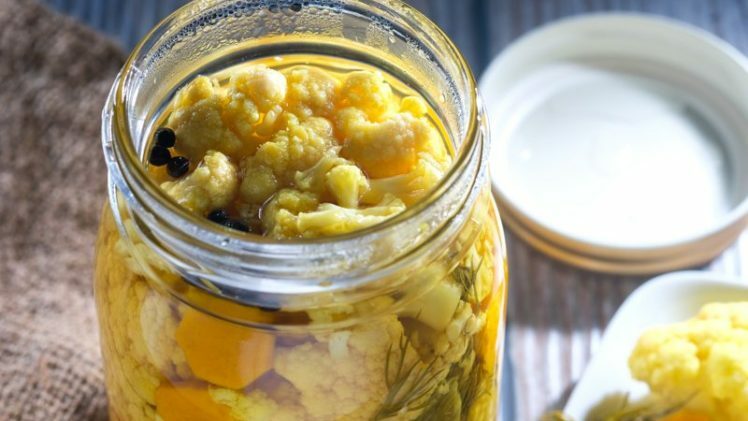 Pickled cauliflower I knew would be amazing (giardiniera anyone?) but I wasn’t sure what the addition of turmeric would do the final flavor. I mostly use turmeric in two places: yellow rice and Indian food, and I can’t claim to use it with flavor in mind. Mostly when I think of it I think of the bright yellow color that it adds to food. But when I found cauliflower in the sale bin, I knew it was worth trying a batch, even if it didn’t turn out as I’d expected. Let’s take a second to talk about the cauliflower I’m using. One of the things I discovered upon moving to the Bay Area, is that cauliflower is not always white. (Sidenote: Carrots are historically white. Seriously. Mind. Blown.) 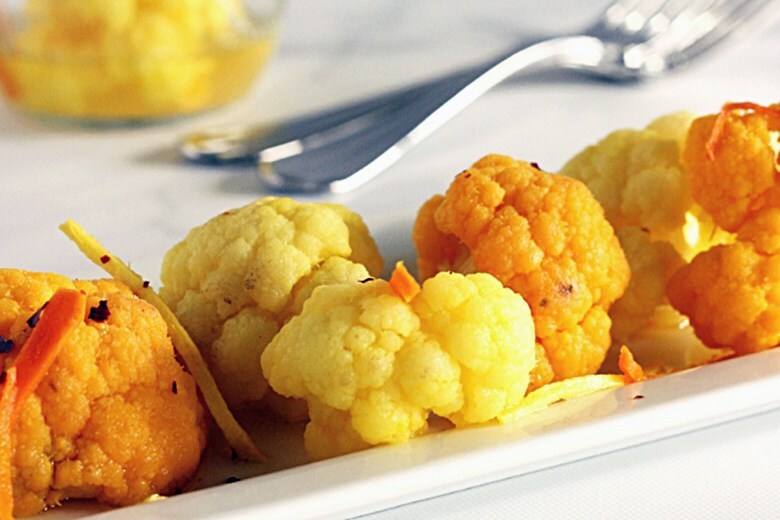 Orange and purple cauliflower are fairly common here and while they don’t taste any different from the white variety, they are fun to add to a dish for the color variation. And since the final product would be dyed yellow by the turmeric, I saw no reason not to start with a pre-colored version. And the effect of that turmeric? It gives a sweetness to the final pickle and a kind of earthy, mustardy flavor although it’s not spicy by any stretch of the imagination. Vinegar pickles, unlike fermented pickles (think supermarket kosher dill spears versus real deli half sours), do not have a particularly complex flavor unless the vinegar brine has some things added to it. In this case the onions and turmeric add a lot to the final product. This is a pretty mellow pickle and as a result it makes a great accompaniment to cheese, salads (go easy on the vinaigrette though), or just eaten straight from the jar. If you choose to water bath can it, you can enjoy them over the next year but otherwise you’ll have to eat them within a few weeks. If they make it that long. A quick note on canning (there are lots below, don’t worry): It takes a lot of attention and space on your stovetop but once you figure it out it’s pretty easy to do and the payoff is huge since you often end up with 5 or 6 jars from one round of canning. If you haven’t tried water bath canning, now is a great time. Also, if you are someone (like me) who generally does not read the recipe until halfway through making it, this is a time to read the whole thing before you start. Trust me; it will make the process much easier. If you have never canned anything, I highly recommend checking out this post for some great tips. I’ve also added some “whys” for the steps below, noted by italics. Bring 5 pint jars and their metal bands to a boil in a large and tall stock pot with a rack or towel at the bottom to allow water to circulate around the entire jar. Boil the jars for 10 minutes, then remove them to a towel using tongs but keep the water and make sure it stays hot – this is where you will process your jars. In the meantime, place a small saucepan filled with about a cup or two of water over low heat and add the lids to the water to simmer. Always use new lids because they lose their sealing ability after processing. The warm water will help soften the rubber that allows the jars to seal. 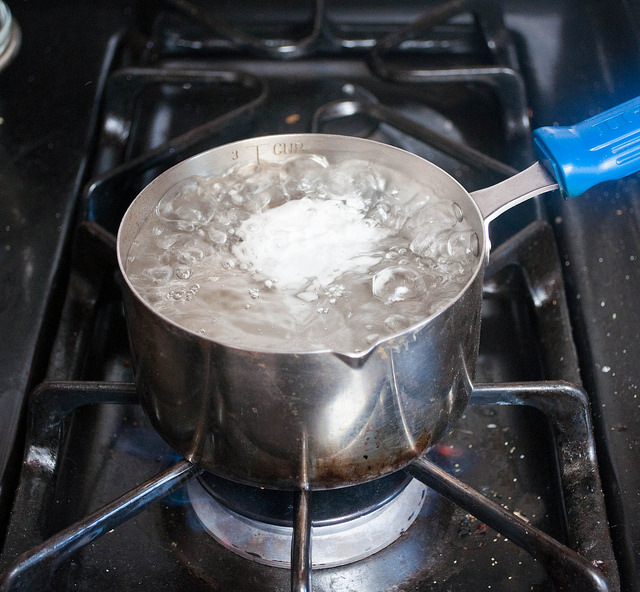 Meanwhile, bring a large pot of water to boil over high heat and add the salt. Add the cauliflower and cook for 2-3 minutes, then drain. 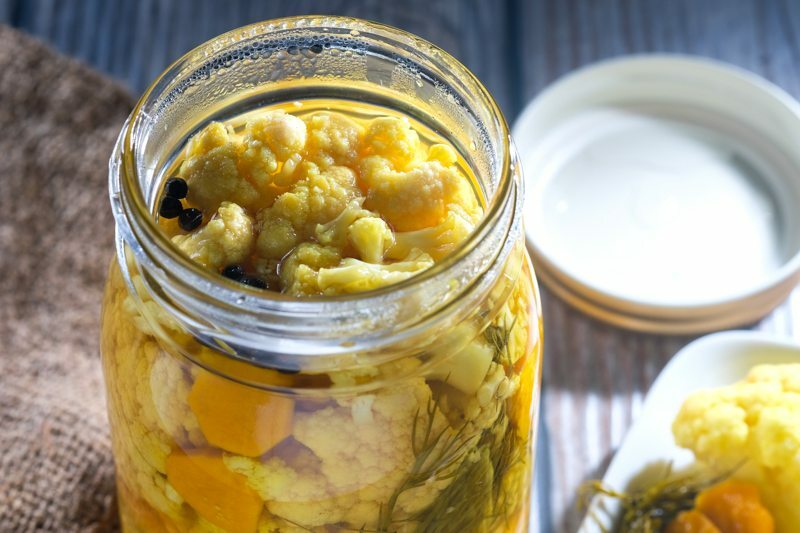 Blanching the cauliflower is necessary so that the interior is warm when the jars go into the canning bath and the internal temperature will get high enough to both seal the jar and kill any nasty bacteria. In a medium pot, combine vinegar, sugar, onions, and turmeric over medium heat and stir until the sugar dissolves. Bring to a boil and boil for 5 minutes, then turn off the heat. Again, having hot or warm liquid in the jars will help the temperature come up quickly during canning and keep the final product safe. Remove the onions and toss them with the cauliflower. 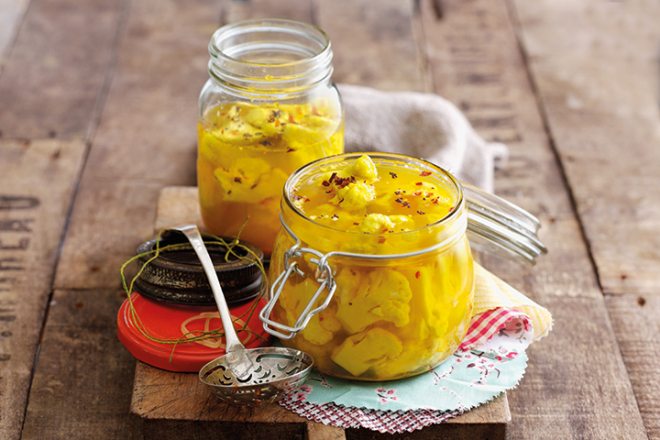 When the jars are dry, but still hot, gently pack the cauliflower and onions into the jars. You will probably have enough for 4 pint jars but I like to prepare at least one extra so that if I have more I don’t have to scramble to sterilize an extra jar. Cover the cauliflower with vinegar, leaving ½ to ¾ inch of headspace at the top of the jar. If you don’t leave enough head space, the jars won’t seal. Once filled, wipe the rims of the jars with a wet paper towel to make sure the lids will adhere and then place the warmed lids on the jars and screw on the metal band, tightening them with only your fingertips. You want them secure but not tight since air will escape during the processing. Place the jars in the pot you used to sterilize them, making them are upright, and add enough water to cover them by a few inches. Bring the water back to a boil, then boil the jars for 10 minutes. Make sure the water is boiling before you start the timer to ensure that the jars get a long enough bath in hot enough water. After 10 minutes, turn off the heat and let the jars cool slightly in the bath for about 5 minutes. 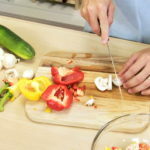 Then remove them using tongs or a jar lifter and place them on a wooden or cloth surface. Other surfaces may be too cold and could cause the hot jars to break on contact. I cover my jars with a cloth at this point, both to slow the cooling process and help ensure a good seal and to prevent me from accidentally touching super-hot glass and metal, which is not an uncommon problem for me. As the jars cool, you may hear popping noises as the lids seal themselves. Once the jars have cooled completely (about 6 hours later), check the seals by removing the rings and lifting the jars by their lids to see if the lid stays – if it does they have sealed. Store them without their rings so that you will know if a seal breaks and see the bottom of the lids to check for any bacteria or cracks in the rubber. Let the jars sit for a few weeks and mellow before eating them. Jars sealed during processing will last for up to a year. If you were not really into Little House on the Prairie books when you were little, then you might not remember that in the seventh book in the series (you know, Little Town on the Prairie) where Laura makes a pie out of pie plant. She forgets to add sugar, serves it, and only realizes her mistake when someone lifts up the top crust to sprinkle sugar directly on the filling. I was obviously really into those books. I giggled at Laura’s dismay over the unsweetened pie, and I wondered a bit about what pie plant could be. And I think I chalked it up to one of those things in books that don’t exist in real life. It was years later, while leafing through those Little House books, and with a brief Internet search, that I identified pie plant as rhubarb. And then I had to make a rhubarb pie. It is called pie plant, I really had not choice. 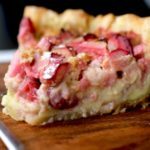 But based on the dearth of rhubarb pie recipes, it has clearly fallen out of favor as a pie ingredient, or at least as the primary flavor of a pie. I just can’t figure out why. 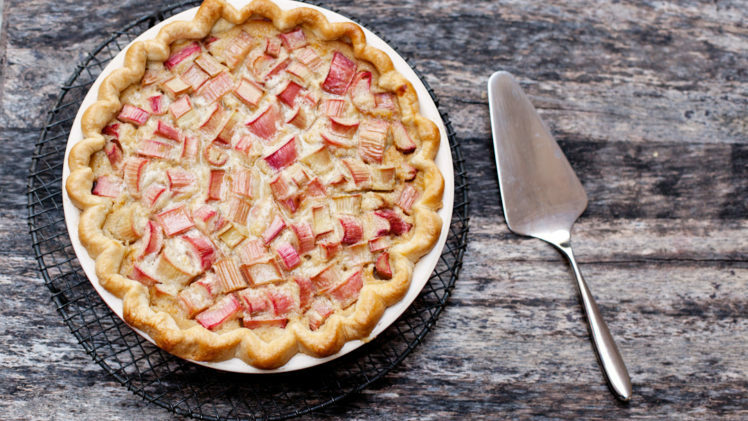 Rhubarb is delicious when baked with sugar (and perhaps a splash of bourbon). It is excellent baked into a buttery cake. Adding in pie crust seems like it can only improve things. Raw rhubarb is a beautiful deep red stalk. Baked rhubarb is a cheerful pinky-red. So while this pie was baking, I imagined cutting the first slice to reveal a bright pink filling, with little pink spots bubbling up around the crust. Opening the oven, the sweet tart cinnamon smell of the pie took over the kitchen, but when I cut into the pie it wasn’t exactly what I was looking for. Rhubarb custard pie filling is… beige. Add to that the browned crust and the custard in the pie filling and you have a toasty brown pie. Golden brown. It’s cute and homey and warm, but not exactly stunning. True to form in unnecessary worrying, I wasted about ten minutes wondering if I should change the recipe. 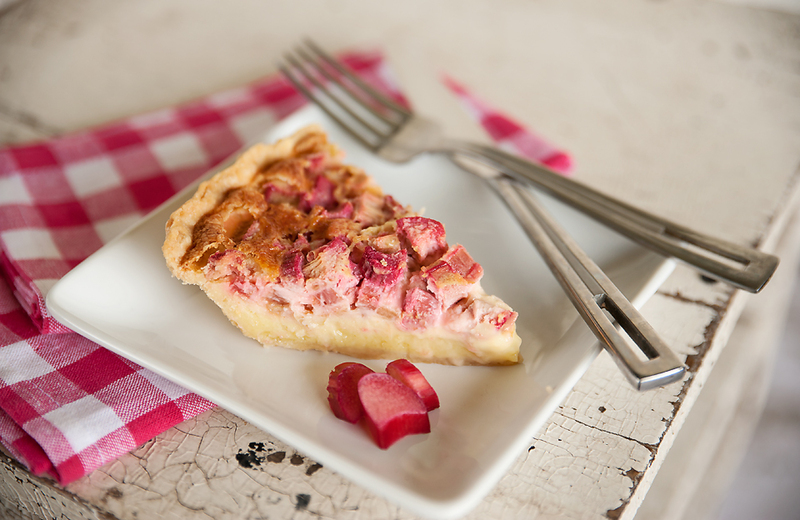 I considered giving up on rhubarb pie and going back to the classic strawberry-rhubarb combo. But after one bite, any thoughts of alterations disappeared. It is sweet and tangy, and whatever it lacks in looks it more than makes up for in flavor. Maybe we should go back to calling it pie plant. But seriously, don’t forget the sugar. GREASE a 9-inch pie pan. Roll out the pie dough so that it's approximately an inch bigger than the pie pan on all sides. Transfer the dough to the pie pan (it's easier to do this by folding the dough into fourths, lining it up so it's centered in the pan, and then unfolding it). Roll up any excess pie dough to create a lip on the edge of the pie pan. Use your thumb to crimp the edges of the dough all around the pie pan (or just leave it tall). Put the crust aside while you prepare the sugar. COMBINE sugar and lemon zest with your fingers to distribute lemon oil into the sugar (this small steps makes a difference in evenly distributing the lemon flavor). WHISK lemon sugar and eggs thoroughly in a medium bowl to combine well. The better you whisk, the smoother the custard will be at the end. Add the lemon juice, salt, and bourbon and whisk to combine. Then fold in the chopped rhubarb. Set the mixture aside. COMBINE flour, sugar, cinnamon, baking powder, and salt in a separate bowl. Add the butter and work it together with your fingers until the butter is the size of peas and well mixed into the flour. Add the bourbon and mix well until it forms a crumbly dough. Break up any large pieces of crumb or butter that come up and then set the bowl aside. 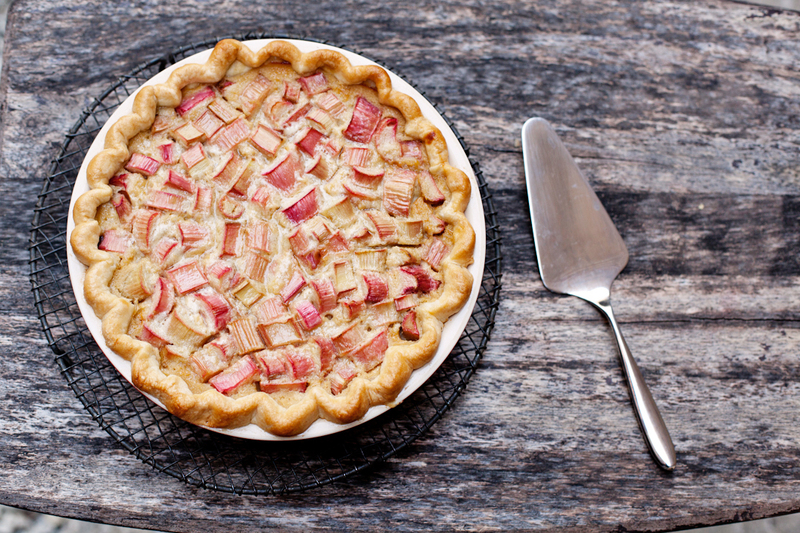 POUR the rhubarb and custard mixture into the prepared pie shell and use a spatula to evenly distribute the rhubarb pieces. Sprinkle the crumb mixture over top, making sure it goes right up to the pie crust. BAKE for 30-40 minutes, until the crust is browned and the custard mixture is bubbling under the crumb. Check it after 20 minutes to see if the crust is burning, and if so, cover the edges with a piece of foil to protect it. REMOVE the pie from the oven and let it cool at least 20 minutes before serving. This pie is best warm or at room temperature. You can also make this pie a day in advance and keep it in the fridge overnight. Reheat it at 200 degrees for about 15 minutes.